does anyone have a solution for a weak RH (UK driver's side) handbrake? I am talking about the short brake line that attaches to the thing on the rear beam and not to the main line. I have changed the short line to a new one but on the MOT they said it's still weak. Shoes possibly contaminated with brake fluid from a leaking wheel cylinder or linkage seized , take the drum of for a look, nothing to do with the cable unless it's broken or stretched. 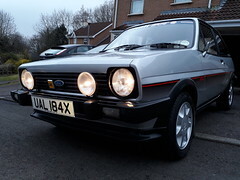 Sounds like you're talking about a Mk1? Could possibly be siezed self-adjusting mechanism or operating arm not travelling fully. Probably best to remove RH drum and take a look to see if the handbrake mechanism is working properly and the opertaing arm returning fully with handbrake off. With drum off you can also adjust the handbrake mechanism manually should you need to.